(CNN) -- John Daly dazzled the galleries at the Italian Open with his garish clothing but stayed in contention for the title after a second successive 69 in Turin. Daly rolls a putt during his second round of 69 at the Italian Open. 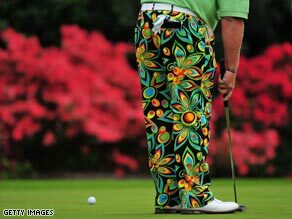 Sporting a lime green top with a pair of psychedelic trousers, Daly was looking to improve on his tie for 31st in the Spanish Open. The two-time major champion is playing on the European Tour after being handed a six-month ban in the United States after a series of lurid headlines. But clearly showing the benefits of losing 20kg after having a gastric band fitted, Daly has shown glimpses of his best form. "Yesterday could have been really low, but today could have been really high," he told the official European Tour Web site www.europeantour.com. "I didn't hit it that great and one-putted the first five greens." Daly was partnering home hope and 2007 champion Francesco Molinari and while struggled early on, the Italian packed an eagle and two birdies into his first four holes to go joint leader. Daly, fashion faux-pas or trendsetter ? But he then slipped back to five-under as he matched Daly with a 69. Daniel Vancsik of Argentina was setting the pace on the second day after carding a six-under 65 for a halfway total of nine-under 133. Daly, who had not played for four months before teeing up in Spain, will look to continue his improved form in lucrative upcoming events. It was confirmed on Friday that he is to extend his stay by playing in the European Open at the London Club from May 28-31. It will be a first appearance in the tournament by the "Wild Thing" who is promoting a new range of clothing to match his more slimline figure.